Pass in X class with overall grade 5.0 (excluding Hindi) for General and overall grade 4.0 (excluding Hindi) for S.C. & S.T. should be studied in rural areas at least for a period of Four years. Age limit: The candidates age should have between15 to 22 years. Applications received after the last date will not be entertained and Dr. Y.S.R. Horticultural University will not be responsible for any postal /any delay. 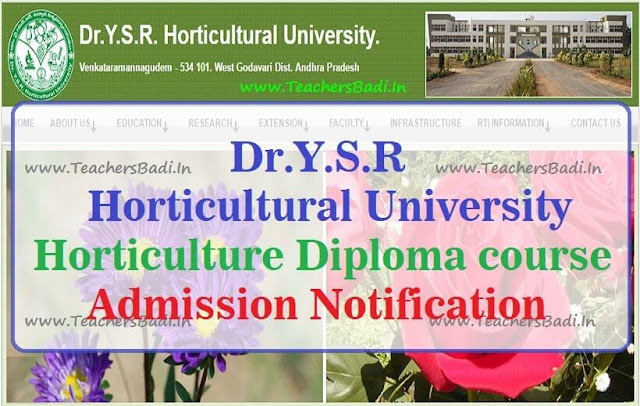 "Diploma in Horticulture course Admission Notification, Application form along with Prospectus can be had from web portal"
Dr.YSR Horticultural University Horticulture Diploma course admissions Counselling dates 2018 to be announced soon, The counseling will be conducted from ....-07-2018. Eligible candidates list and other details please refer to the official website. Telangana Junior inter hall ticket 2017 ..